The summer of nothing! I had no car, no bicycle, no girlfriend, few work friends, rarely went anywhere, didn't drink, and was living in the dormitories on $560 a month. Pretty boring really, but I liked my freedom. In July I began planning my new bicycle. I had no idea it wouldn't materialize until March 1986. My friend Bill Keller opened my eyes to what was out there and so my desires kept getting bigger and more expensive. I went to air shows on base (I'm the red dot in front of the F-111), watched the Thunderbirds and did a lot of Air Force stuff. I lifted weights three times a week, joined the Honor Guard, volunteered for everything, finished my career development course in 45 days (less than half the time required), with a final exam score of 93%, CLEP'd U.S. History and started college classes in September where I had a 4.0 Grade Point Average until I took the summer of 1986 off and never went back. It was productive but not much of a life. I was putting away so much money I only had $200/month to live on. I still had no idea how to ask out a woman although I was almost 20 years old, and besides that, I wasn't interested in anyone. My goal in life was to do my best in the Air Force, save money, go to college, get an Electronics degree and get out of the Air Force in four years to work at the General Electric plant in Owensboro, Kentucky. However, I began talking to Tina Franklin, the younger sister of Cathy Reiner's best friend Lisa, just before I left for the Air Force and we became pen pals. She was sweet. She sent me a photo of herself and to the left is the picture I drew from it. I have no idea where the actual photo (or Tina) is. I was one of the hardest workers in my office...I rarely took breaks and didn't screw around at all. I won Airman of the Month, my commander and my boss loved me! Everyone thought I had a bright future in the Air Force. you to tears(I never cried). I eventually grew comfortable and my sense of humor came out. 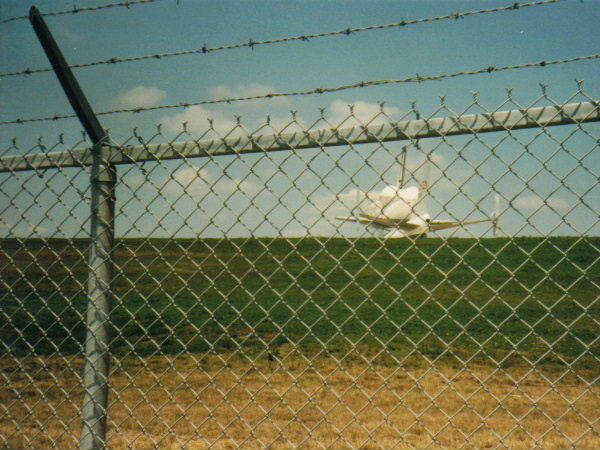 I was known as Psychopath.On July 14 the late Space Shuttle Columbia flew through Offutt. A crowd turned out to see it and I chased it down the runway on foot (no car or bicycle, remember?) and shot these photos of it taxiing. Then I walked to Iowa (I was bored).